To be fair, I talk about magic a lot. It is one of my favourite subjects. I also find spirituality fascinating, and I love a good ritual. But you might be surprised to hear that, in my mind, these things are not necessarily related. Magic — as I define it — stands totally separate from the new age, spirituality, religion, and metaphysics. I received this excellent question yesterday, and I thought it was the perfect time to address the subject. Magic is around us at all times. The question really is, are you going to allow yourself to see it? Whether you allow magic in your life or not is simply a matter of perception. Now, you may be surprised to hear this, but when I say magic, I’m not referring to spells, or chanting with the Moon, or making the babe of your dreams fall in love with you. My definition of magic is seeing things with new eyes. Magic is gratitude. Magic is reverence for nature. Magic is loving someone for who they really are — not who you wish they were. Magic is recognising your true power and choosing to honor it. Magic is when you decide to see a situation differently. It is a shift in perception that usually, no one else will notice (although they will eventually observe a change in you). Magic is not anything more than that. Magic is about the choices you make. I love lighting candles, setting intentions, and doing rituals in the bathtub just as much as any other mystical mamacita. But I am acutely aware that my power is within me, and not in the ritual. You can be the most magical, aware, rapidly-manifesting babe on the block but never touch a deck of tarot cards. There is a very real sickness in the new age community: a plague of giving away our power. We think our strength is in our crystal grid, or in the words of our guru, or within the pages of A Course In Miracles. We refuse to make a decision without reading three different horoscopes and consulting our favourite energy healer. It’s an easy trap to fall into, but it is nonsense. All of these things can be useful, but they are just tools. They are not the be all and end all. You are your own divine authority. No one else knows you better. Don’t give away your power. 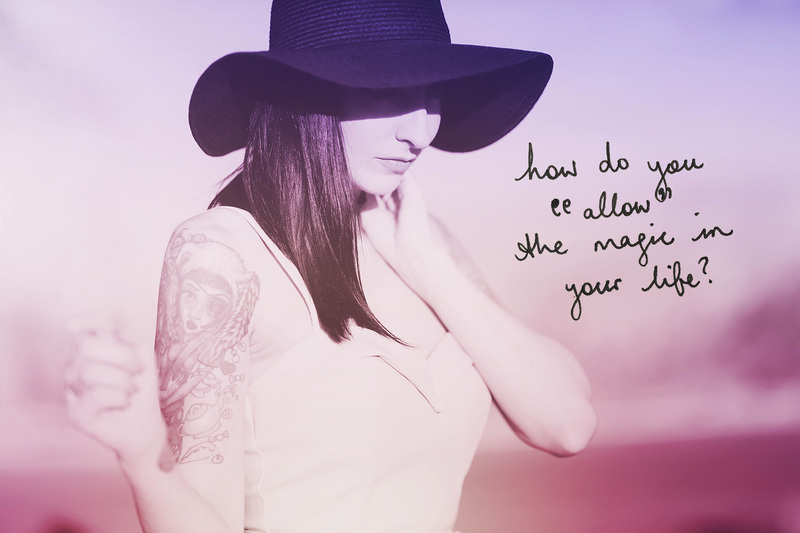 How do you allow the magic in your life? Believe in yourself. Know yourself. And bring it to absolutely everything you do. I am vehemently pro-transformation. I believe we all have massive potential that we barely recognise. We see a tiny green shoot above the ground but forget about the roots that go down a mile deep. Because I believe this, I am obsessed with finding the tools that can help us change. I tell everyone that radical self love, meditation, tapping, EMDR, therapy, journalling, and spending time alone can change your life. Because for me, they have. I am only interested in the things that create true metamorphosis. I despise theory, and crave action. That’s why radical self love is a deeply grounded and sensible process: it is very cerebral, it requires mammoth amounts of honesty and openness, and the only way it works is if you apply what you’ve learned. There’s nothing light or fluffy about it. But I also recognise that one size does not fit all. Different approaches work for different people. Some of us want a checklist to work through, while others would prefer a ritual to help them visualise their goals. Both styles are effective, and come with their own unique pitfalls. People who love checklists can be overachievers who rush through things trying to get to the next milestone, and people who get off on ritual can get distracted by the mysterious beauty of it all and forget to do the work. As long as you’re focussed on your end goal, go ham! Who cares how you do it? Both styles eventually lead to the same place. I will encourage you to do anything as long as it works! The older I get, the less black-and-white my thinking becomes. It’s tempting to write off the techniques that don’t personally appeal to us, but that is narrow-minded at best. When you take your need to be “right” out of the equation, you can see the value in almost everything. It all comes back to perception… You know? « When It Feels Overwhelming To Revolutionise Your Life, Where And How Do You Begin?